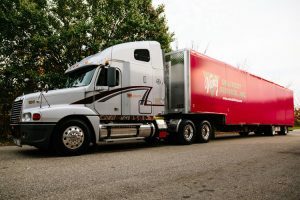 Van’s Delivery Service specializes in single and multi-stop truckloads that deliver throughout our 32 State operating range that spans East of the Rocky Mountains. List of specific states are listed below. We also have a Brokerage Service with the authority to service the lower 48 states. By partnering with our network of reputable and reliable carriers we are able to meet your national needs. We have the capabilities to truck 64,000 pounds of steel across the State of Michigan, or deliver one small skid across town or deliver a truckload anywhere in the country. Our goal is to make your job easy by handling your supply chain needs in the most cost effective and efficient manner. We have been delivering Courteously and Promptness Assured since 1925. Are you looking for a cost effective solution for additional storage space in West Michigan? How about using one of our clean and dry 48’ Storage Trailers for additional storage space. We refer to our storage trailers as mobile warehouses and can be just the ticket for your additional storage needs. Give us a call to check rates and current promotions.